Evaluate the readability of print materials, and apply readability guidelines to your own document. Learn about reading theory and how you can use it to improve your work. Apply what you learned in Lessons 1 and 2 to create a document. 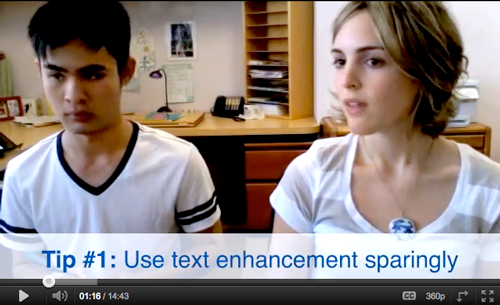 Watch Transcend’s fun and informative training video on the visual aspects of plain language. These six 3-minute tips help you write documents that your clients will want to read. Transcend offers the following webinars. Each webinar is 1 hour and can be scheduled to meet your needs. Why Plain Language? An overview of plain language, including economic advantages, relative effectiveness, and compliance with regulations. Reading Critically: How to critically analyze your/someone else’s writing; tools for analysis – checklists, WORD functions, using color; LawNY’s Write Clearly gadget, developed by Brad Reiss. Or ask Maria Mindlin at me@transcend.net to tailor a class to your organization's needs. For more information about our webinars and live training, please contact the senior instructor, Susan Holmes at susan@transcend.net.